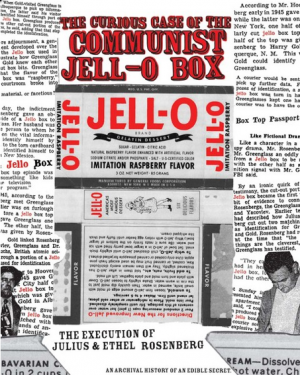 What could possibly be the connection between imitation raspberry Jell-O, communism and the execution of Julius and Ethel Rosenberg? I was intrigued. After all, what self-respecting leftist would not be interested in the case of the Rosenbergs, who at the height of the Red Scare were convicted of smuggling secrets to the Russians? 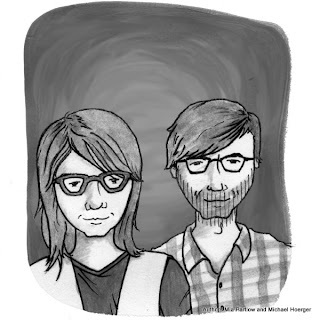 The Curious Case of the Communist Jell-O Box (CCCJB) is a political zine by Michael Hoerger and Mia Partlow, which folds out into a full-sized poster, but for maximum enjoyment you have to read it as you unfold. In other words, the story unfolds as you do. Your inner geek will be tickled pink with reproductions of the now-declassified transcripts from the 1950 Grand Jury trial and a declassified CIA memo that supplies background material on how to counter Pro-Rosenberg propaganda. The collage of period newspaper clippings and sensational headlines from both sides of the political spectrum with their scratchy and at times illegible letters give the zine a genuine 1950s look and feel. CCCJB left me wanting to find out more about the Rosenbergs and the two children they left behind, and a link to further reading about the case would have been appreciated. But overall this was a well planned undertaking and a lot of entertainment for just two bucks. I checked out the authors’ website, and they have other food-related political zines with other declassified documents…excellent…excellent! : Jello & Its Communist PastTweet this! I loved it too, and I don't think that it would have been as good if it had been in a book. The authors chose the best medium. Thanks for your comment. thanks so much for posting this! this is so so so awesome. was wondering though, could you guys change the credit on the author drawing from Nate Powell to E. Chris Lynch? That would rule so much. We wanna make sure Chris gets the credit for that one because dude worked super hard on it. Anyway, thanks again for posting this one. So cool.